Female up to 1 3/4 in. or 8.5 cm. Male up to 1 7/16 in. or 7 cm. 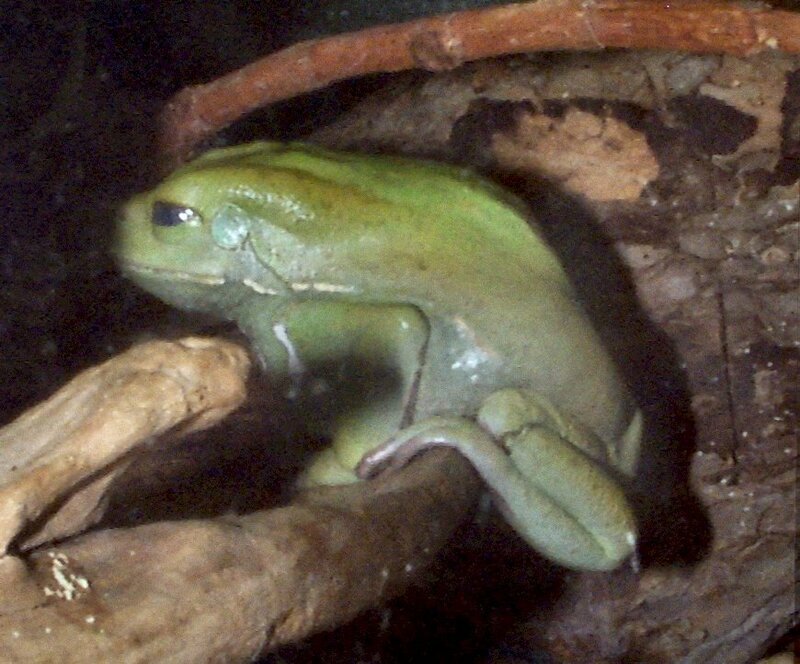 Hind legs are smaller than local frogs. 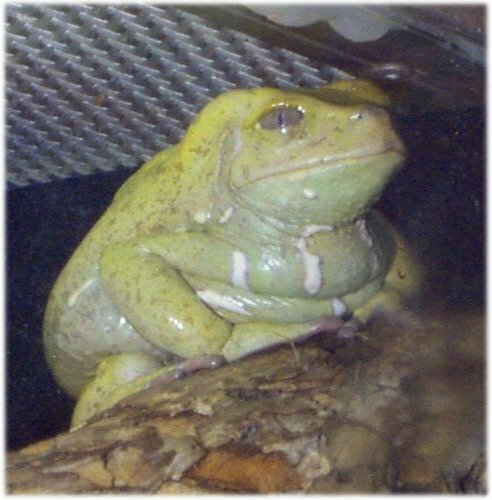 Frogs live independently. They lay eggs on a leaf. This is why its called a leaf frog. Then they roll it up and make sure it stays that way ith a waxy substance that they produce. Then when it rains, the eggs get caught by the water and are rushed out of the leaf and into a pond or other body of water. The eggs hatch and the baby spends the first part of its life as a tadpole. Eventually the tadpole forms legs and its gills change to lungs. It is then that the tadpole comes onto land in the form of a frog. This frog catches very small insects such as flies and ants for its food. The Argentine Leaf Frog has several features that distinguish him from other species. His green skin generally matches the color of the vegetation around his home. The white spots are not only used for identification between frogs, but also for camoflauge from predators. 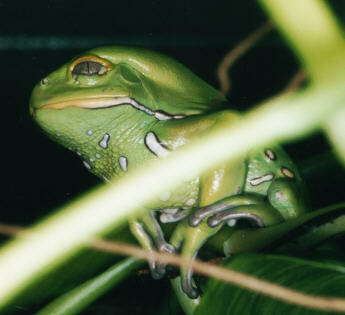 The Argentine Leaf Frog at the Fort Worth Zoo is a Female. 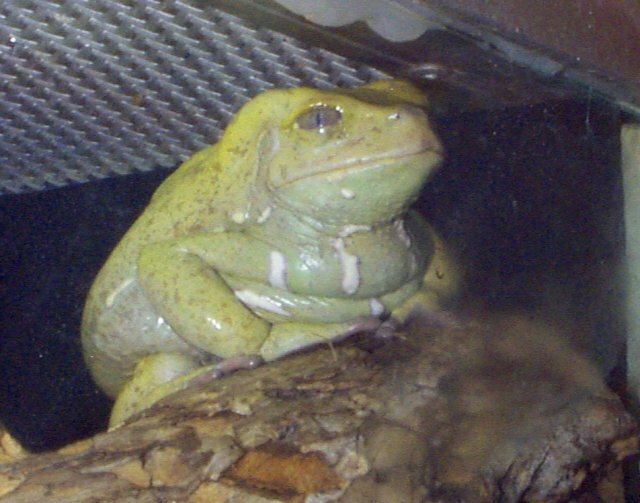 Right now the zoo only has one of these frogs on exhibit. In the zoo this frog stays in the same place most of the time. It is not the most exciting animal to watch, but it certainly is one of the more beautiful species in the Herpetarium. A special thanks to everyone at the Fort Worth zoo for their help.